One of the less well known of the mature operas. I've just ordered the Abbado but what would you recommend? Among stereo recordings, the Abbado is the clear choice, but if you don't mind very iffy sound, seek out the 1939 Met broadcast with Tibbett, Rethberg, Martinelli, and Panizza conducting. The VdlA/Gobbi/Christoff recording is fine, but would have benefitted from a better conductor than Santini. The Abbado for sure, heads above all the others! Quite a few opera recordings would have benefitted from a better conductor than Santini! The EMI recording with De los Angeles and Gobbi is a miracle. Another vote for the Abbado. I can't imagine a better performance. 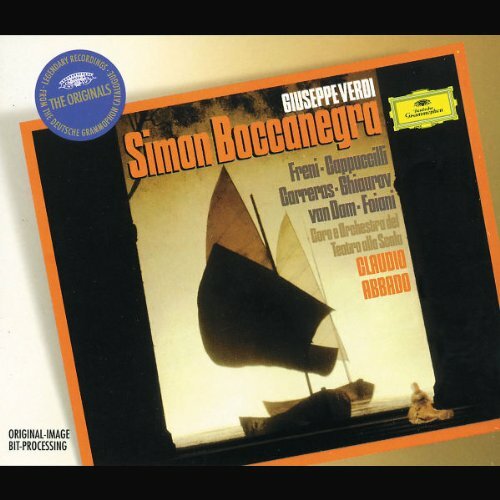 Boccanegra turned for me as a different scope in a Verdi opera, without key moments that drive the narration. The water and soothing music is however a very positive point, and both conductors have succeeded at this portrayal. Cappuccilli as Simon and Freni as Amelia are unbeatable, but there is still an intuition that a bit more drama could be added to the music in general, as the style is based here in getting the best out of the score. A unique opera that I would love to see staged. From the Verdi opera feast in February-April. Unfortunately I cannot give any news to you people. This rules. Last edited by Granate; Oct-14-2017 at 16:10. The Abbado is justifiably the most recommended version, and the one I like the most myself I suppose. I'd probably like it better had Cappuccilli and Van Dam swapped roles, I tend to find Cappuccilli a little dull and Van Dam is a singer I prefer, so having Van Dam in the lesser role feels like a missed opportunity. I also don't feel like this role really shows off Freni's gifts, but she's certainly fine. Excellent performance from Carreras though, one of my favorites, and Ghiaurov is practically definitive. I don't think the gap between this and other recordings is probably as great as many critics imply--the Gavazzeni with Cappuccilli, Ricciarelli, Domingo is also very good, the live Abbado with Bruson, Ricciarelli again, Luchetti, and the Molinari Pradelli with Silveri, Stella, Bergonzi are all worth many listens. I also just picked up the Hampson Opolais Calleja performance last week that I have high hopes for, I haven't gotten to it yet though. Hence my preference for Gobbi in this role. I'd probably like it better had Cappuccilli and Van Dam swapped roles, I tend to find Cappuccilli a little dull and Van Dam is a singer I prefer, so having Van Dam in the lesser role feels like a missed opportunity. That would be my second choice too. It's on my list! I don't know when this performance is from (my googling hasn't gotten me much info about the provenance, I assume this is a recording of a live performance), and I have to admit that most of the names other than Van Dam are pretty unfamiliar to me. I have a sneaking suspicion that it's unlikely that the performers on this disc will measure up to Ghiaurov, Carreras and Freni.... Have you heard it? Last edited by howlingfantods; Oct-15-2017 at 07:18. All times are GMT +1. The current date and time is Apr-25-2019 11:16.